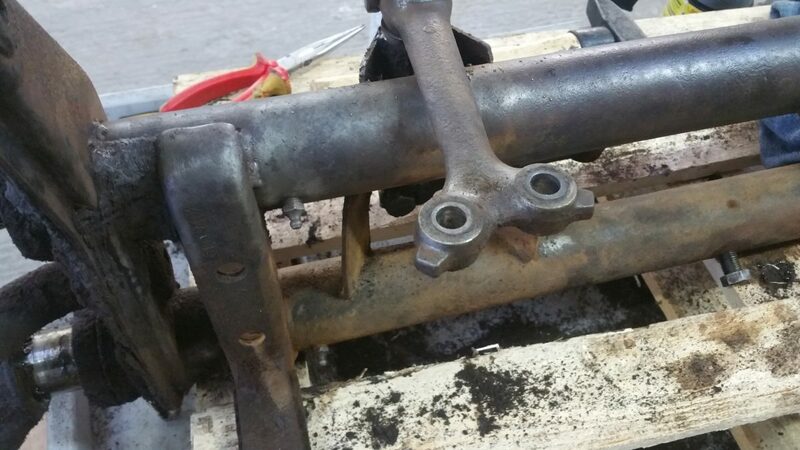 as you know from a previous posting I disassembled the Samba´s front axle unit before I´ve send the front and rear end of the Bus to Mark. 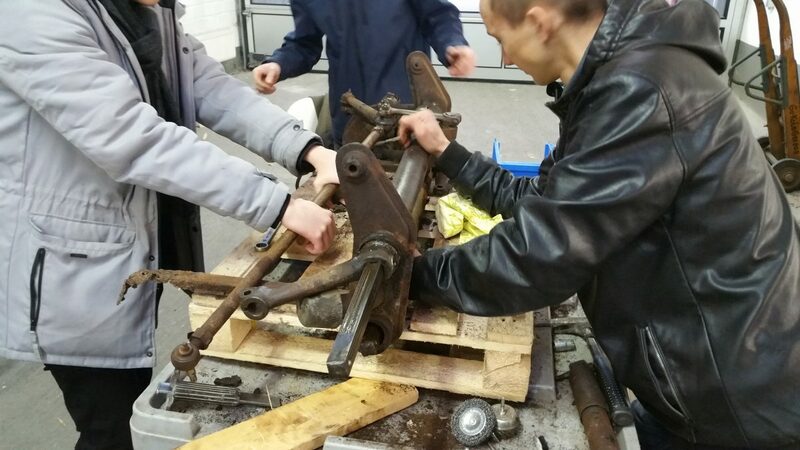 A front axle assembly of a classic aircooled car is a complex device. 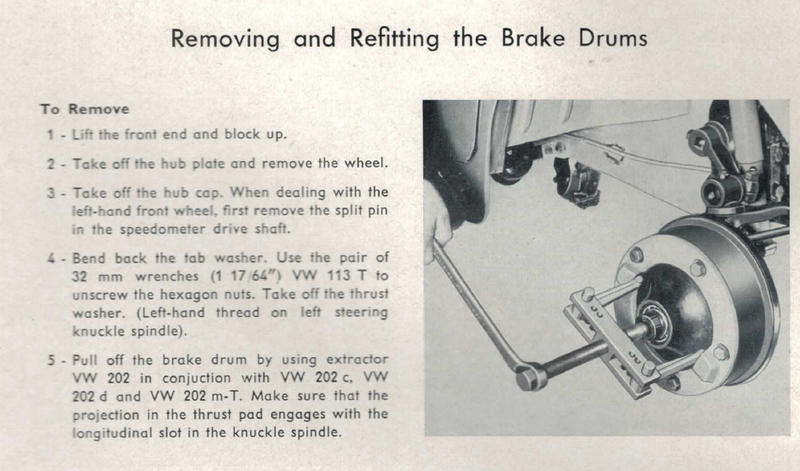 Many of its individual pieces can break or at least wear out: torsion arm leaves, the torsion arms themselves, the king- and linkpins, the brake backing plates, the wheelcylinders, the brake shoes, the wheel bearings, the drums and many small pieces as well as the basic body of the axle beam itself. So I thought it would be a good idea to dissemble the whole unit to the very last screw. This way I could control all components and repair or replace them in case it would be necessary. 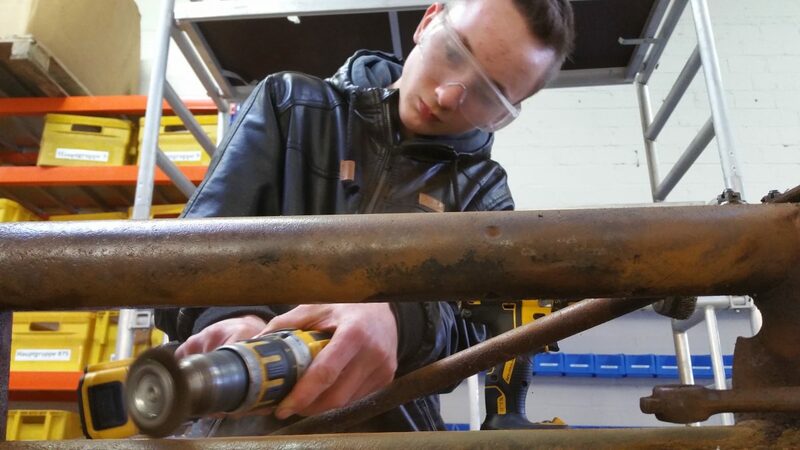 One damage was clearly visible right away: the big brackets between the lower axle tube and the body of the Bus were rusted off, so there is a need of welding at least this. 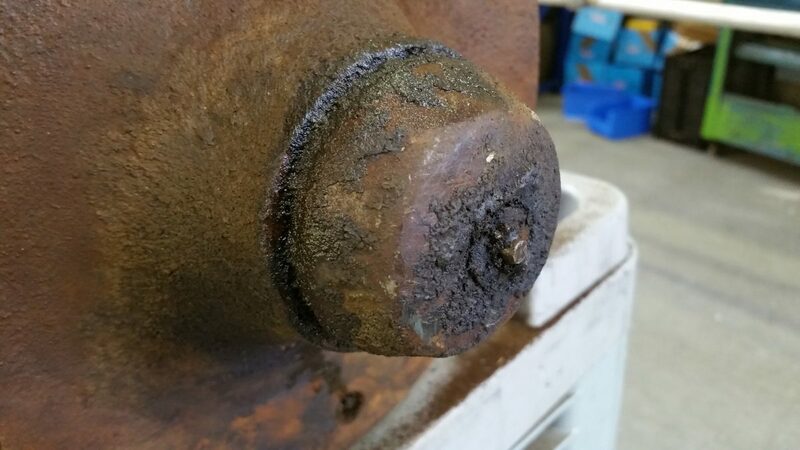 But I expected a lot more of work or even worse: the conclusion that the axles body is not repairable anyway cause of rust. 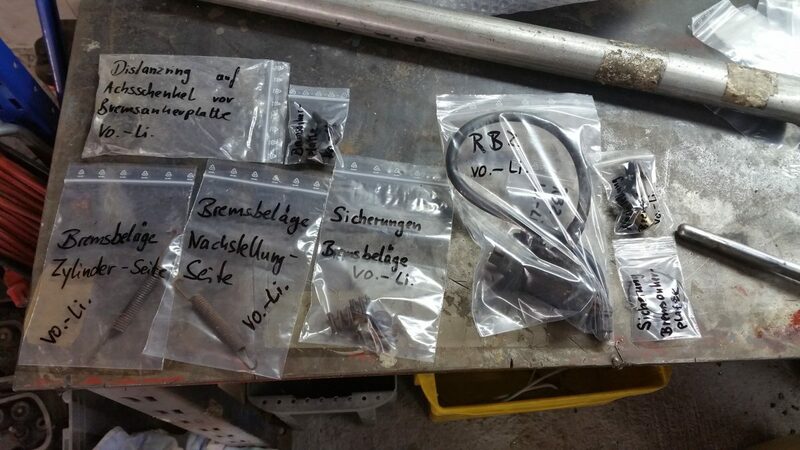 But to end up with this conclusion we have to disassemble all the components first. 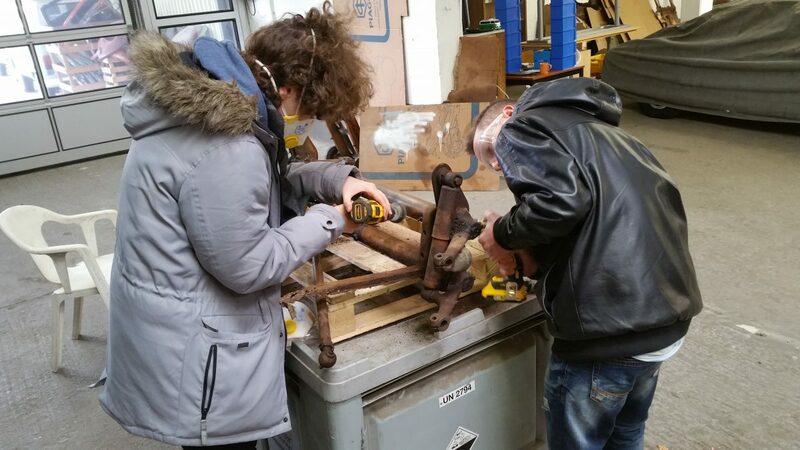 So let´s start the job, disassembling is not too complicated; this is a job I can do. All I need is being careful not to brake more than what is already broken. 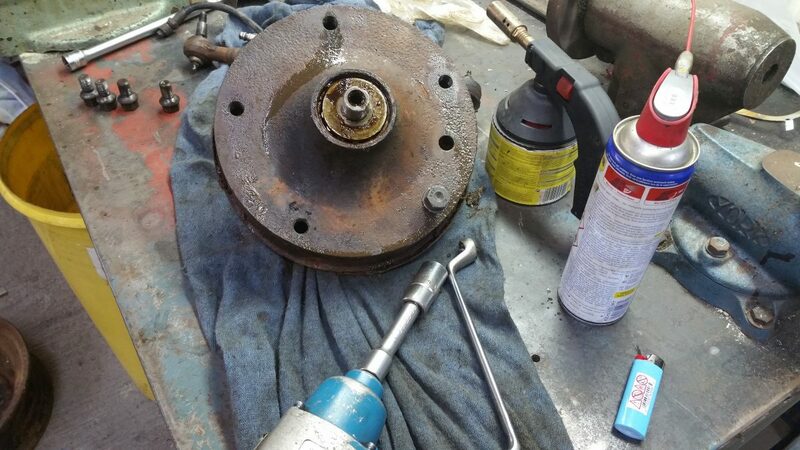 I wanted to do the job in an organized way: from the outer to the inner, beginning with removing the brake drum. But in opposite to the rear drums both of the front drums didn´t turn a single millimeter! OK, let´s remove the grease cap and see if there are any surprises. How to remove a totally blocked drum? A look into the VW workshop manual is always is good idea. So what advise can the gentlemen in Wolfsburg give us? Pfffff…. I don´t have the “extractor VW 202”, neither the tools VW 202 c, d and m-T. But looking at picture of the extractor gives me an inspiration to construct something similar as this tool by my own. Constructing this extractor needs to sacrifice a 5×205-wheel. I will check my stock of these wheels later to choose a bad one which I can sacrifice without regretting. For now I decide to continue the disassembling by removing the complete steering knuckle unit with the drum and brake system mounted. 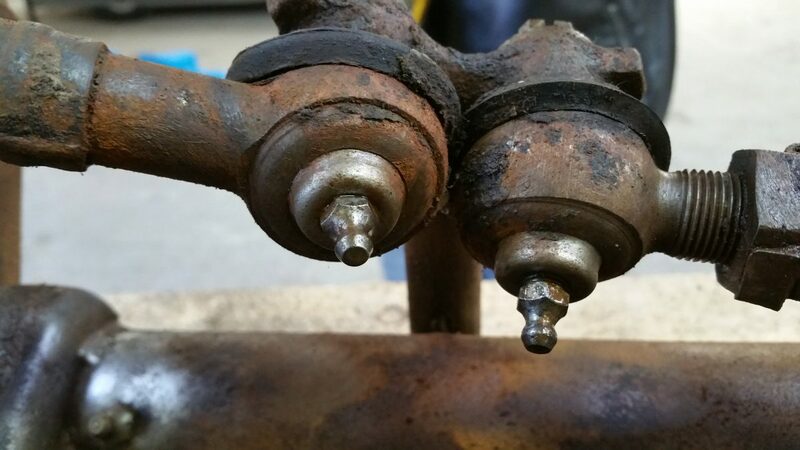 To remove the steering knuckle unit I have to lose the drag links. So let´s clean the drag link ends carefully. 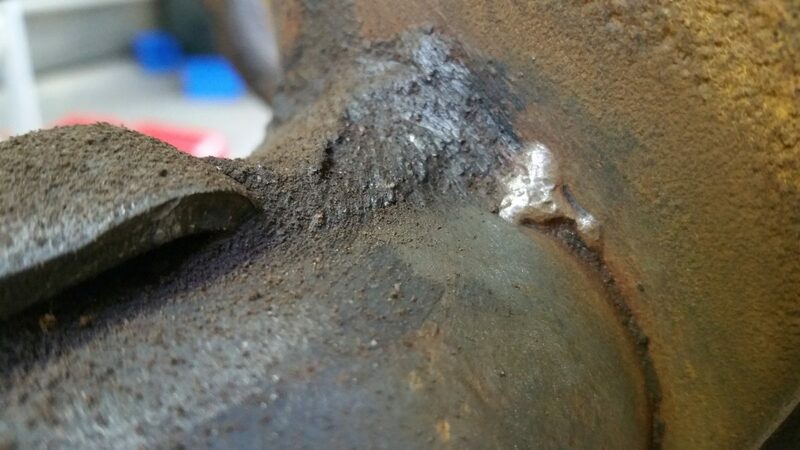 I am not too surprised finding the nuts of the draglinks secured by the very old style, original cotter pin. As I am confirmed in my believe that the Samba didn´t run a high mileage by many other hints while disassembling, this situation here is another proof. Does look good, doesn´t it? Maybe I will use the original draglinks again. I will have close look on them later. Let´s continue now with the disassembling! Removing the shock is next on the list. But being careful is very important here. 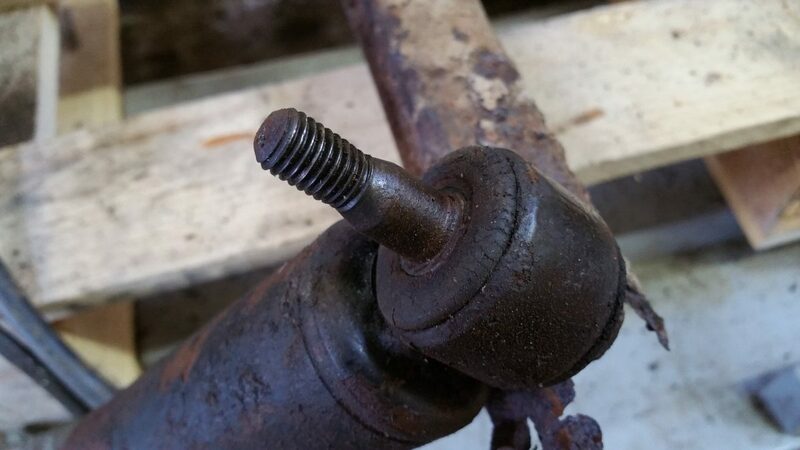 The upper fixing screw of the shock often brakes when apply too much force to it. In addition to the need for a new screw (which is not so easy to get, cause it is not just an ordinary screw, it´s a VW-specific item with an own VW spare part number!) 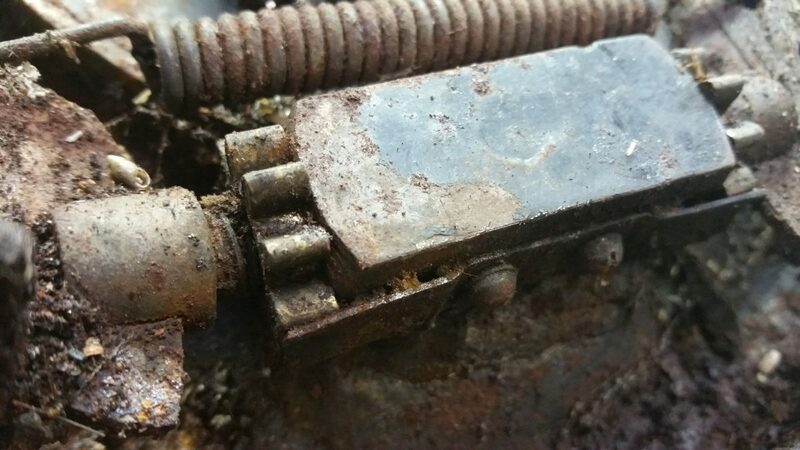 the rest of the broken screw is stuck in the body of the beam and removing this without destroying the thread is a hell of a job! So applying rust resolver is a must here, but this is not enough. The risk of breaking the screw is still too big. 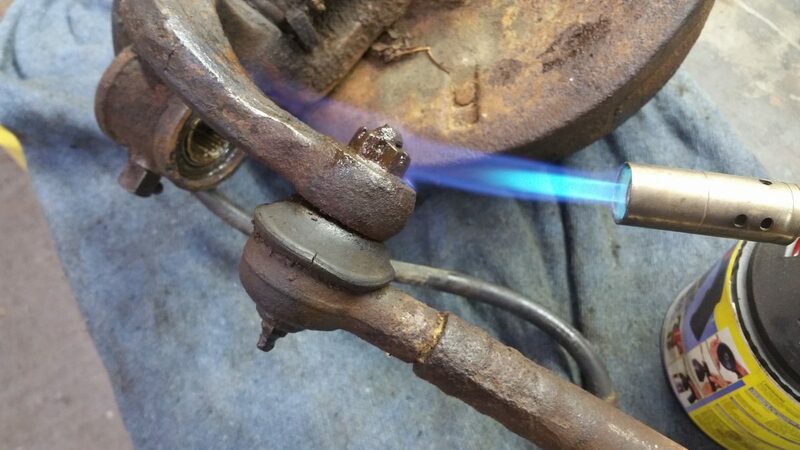 To heat the whole thing up is always a hopeful way to lose a rusted screw. So let´s try it! 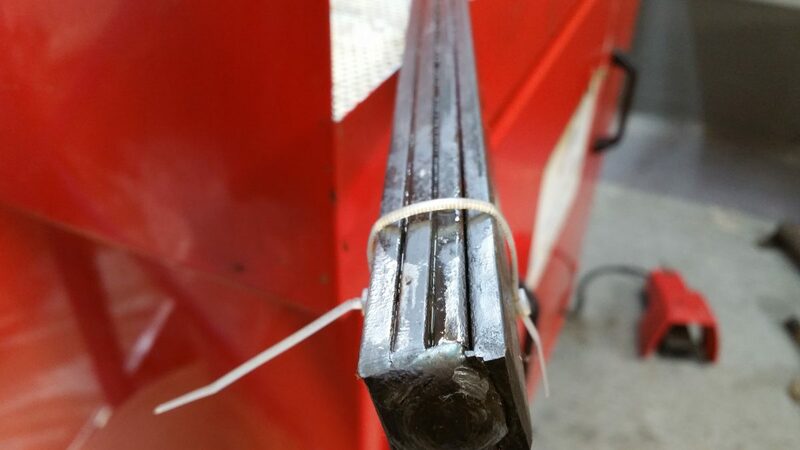 It doesn´t work all the times, but heating up raises the chance of losing the screw without breaking it big time! Gotya! See, the thread of the screw is way smaller than the rest of it, so the screw got kind of a predetermined breaking point. Now when the shock is out of way, we got room enough for a cleaning job. Here you see my two pupils Mert and Lars, two teenagers send from a local school to sneak into the “real professional life”. Strange idea to learn something about today´s professional life in my odd enterprise. I am a bloody bad teacher, I learned my profession on the junkyards of Bonn and Los Angeles, what for hell could an analog dinosaur as me teach a teenager today? Let´s face it: they could teach me! For example how to handle a smart phone…. But sure I don´t miss the opportunity to show young people that there is more you could use your finger to but wanking and a mouse click. 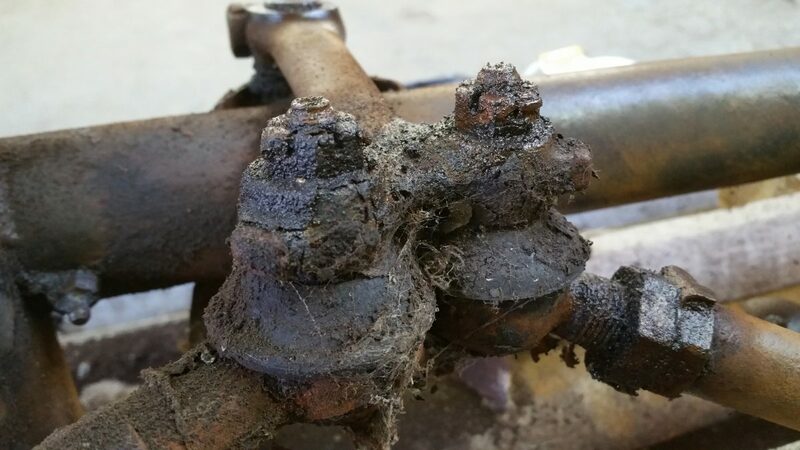 For example remove some antique dirt of the boss´ very personal car´s the front axle. Just kidding. They also worked in the goods-in, the packing station and the warehouse too. But, believe it or not, working on the Samba project was their favorite -at least they said so. Mert, would your mum agree that this bright jacket is a smart choice for this kind of job? 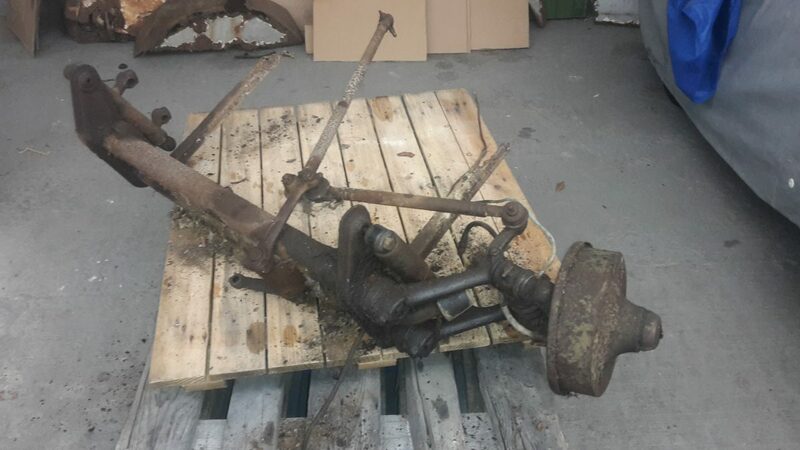 OK, this is a very unusual way to pull out the torsion arm leaves, but this side´s torsion arm is stuck and I don´t want to hammer it out while the fragile leaves are still in place. 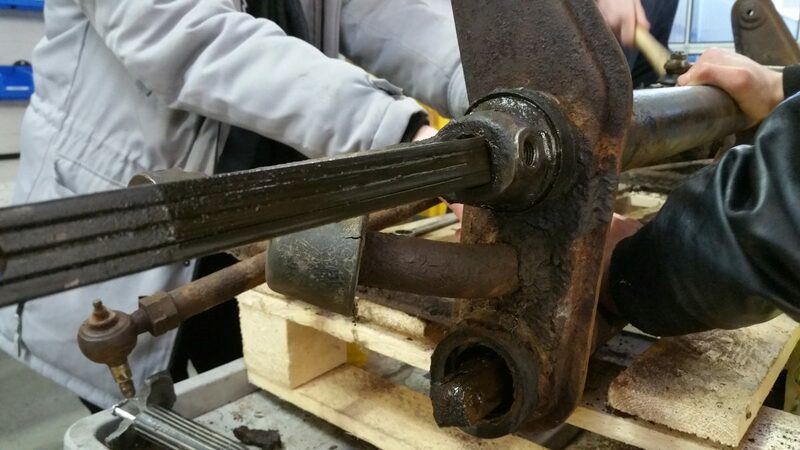 One last torsion arm to remove and we can continue to clean the beam´s body. 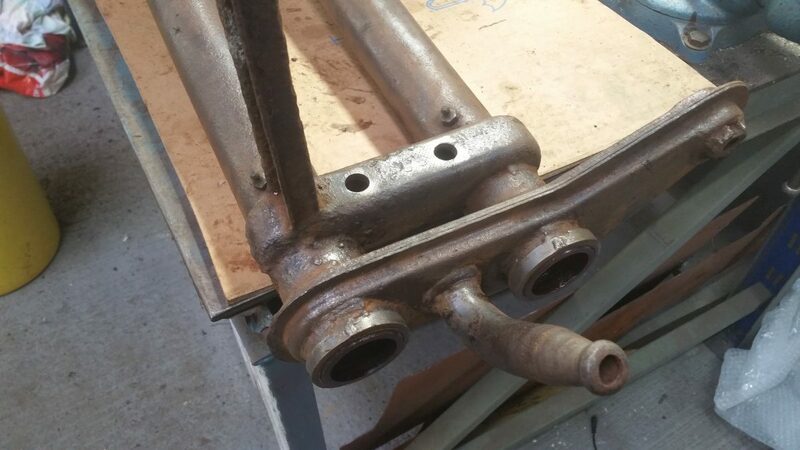 The result of the cleaning process: this beam´s body is way better than expected! No rust hole at all. None of the leaves is broken! 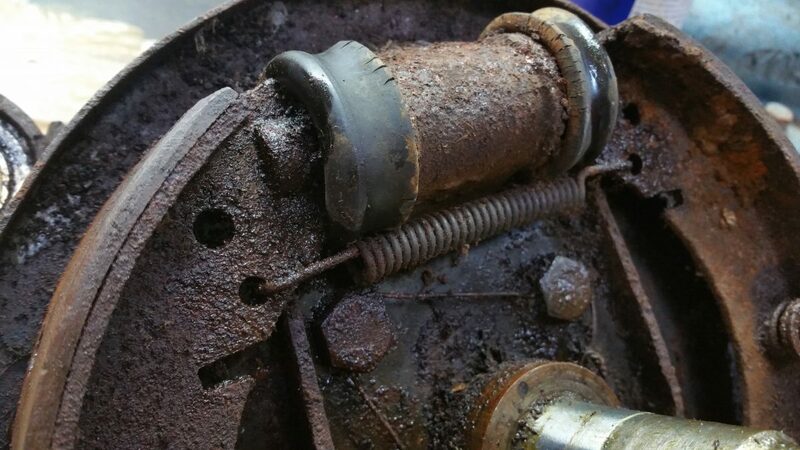 As the Samba hadn´t had any wheels mounted in the front when it was found, the threats of the front drums are very rusty. 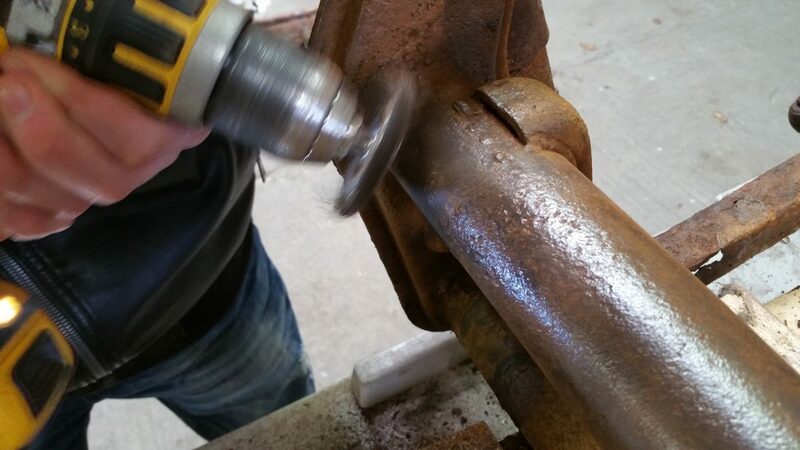 To clean the threats up and save them I have to screw in some wheel bolts very carefully. 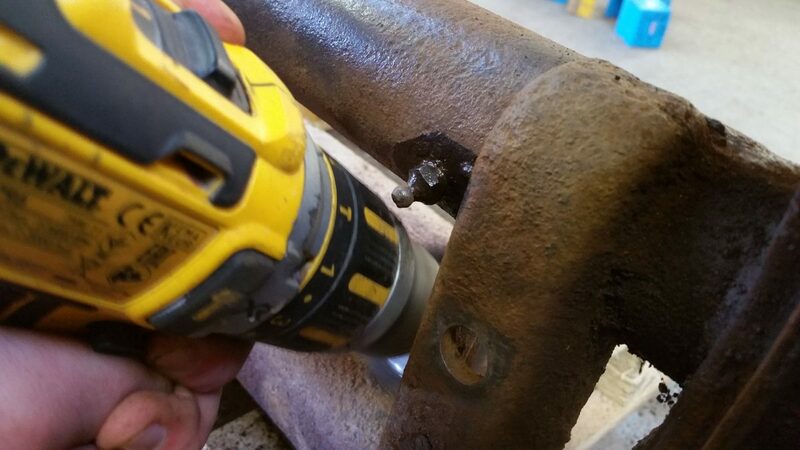 Sure the bolts suffer from this procedure and I better don´t use them again. I sacrificed one bolt for each threat, but as I have enough of the bolts cause of hundrets of bugs I stripped since 1986, this isn´t too painful. May I present you? Florian´s self-made extractor. Will this “tool” work? Remember this great Toy Dolls´ song ‘Spider in the dressing room’ ? 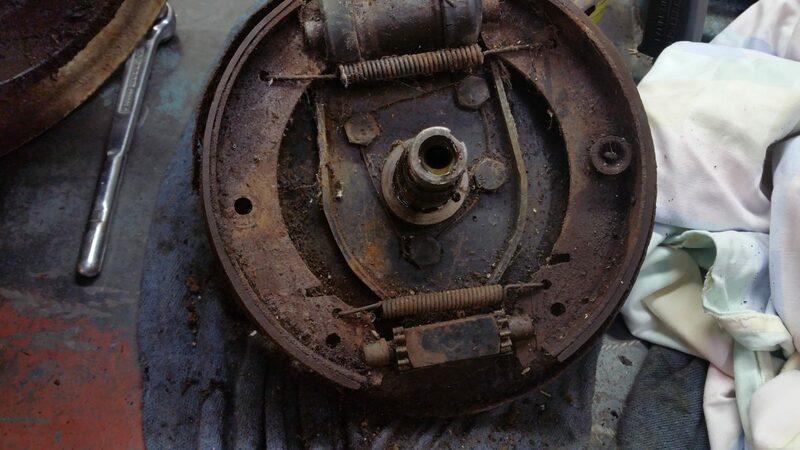 You know me, I always try to save as much patina as possible, but there is a red line: the brake- and steering system. 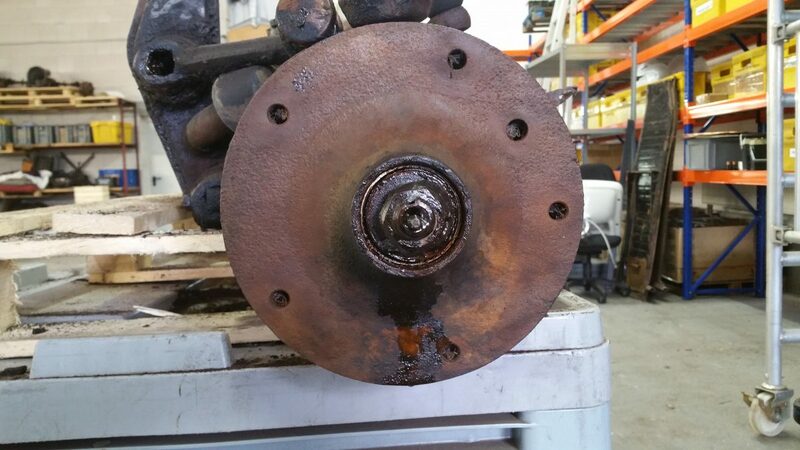 If the engine blows up caused by too much patina it´s one thing and it´s just me who has to suffer. But if the brakes or the steering is going to fail, others will suffer caused by odd addiction. 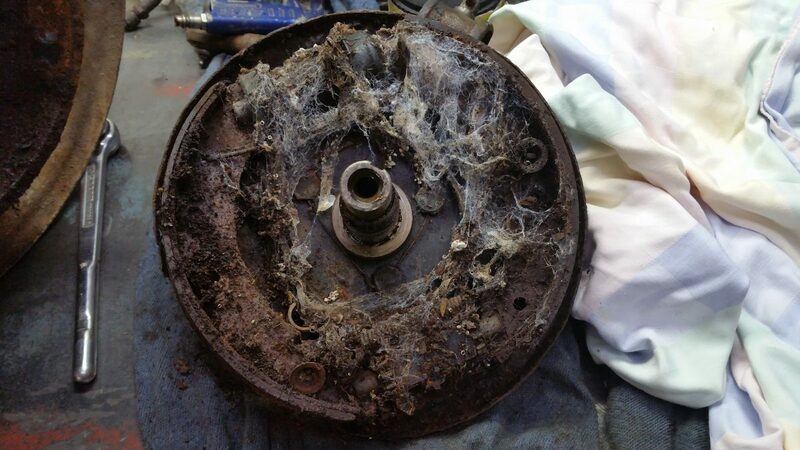 This must not happen, so let´s say ‘Good by’ to the spider´s mesh and clean the brake system up! Pretty, pretty original! 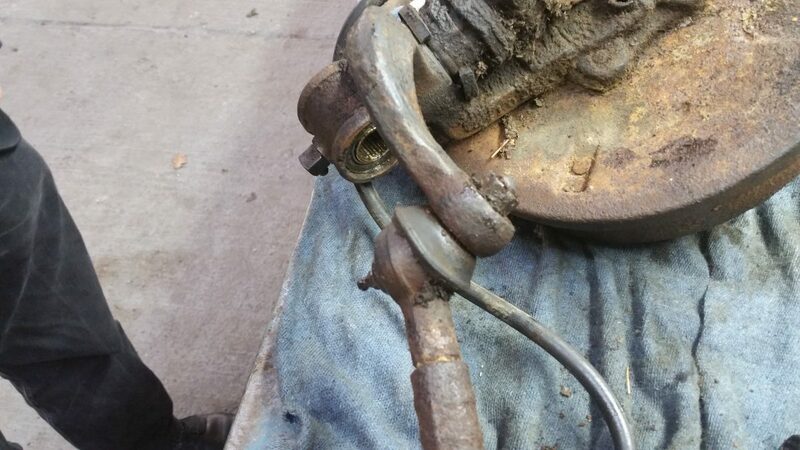 Correct four bolt wheel cylinder, wire secured bolts, this Samba didn´t drive too much mileage in its life for sure! Look at this! Haven´t all of us seen this area much worse in our lives? What a nice surprise! So many original parts in place, the effort of needed repairing is way less than I expected. 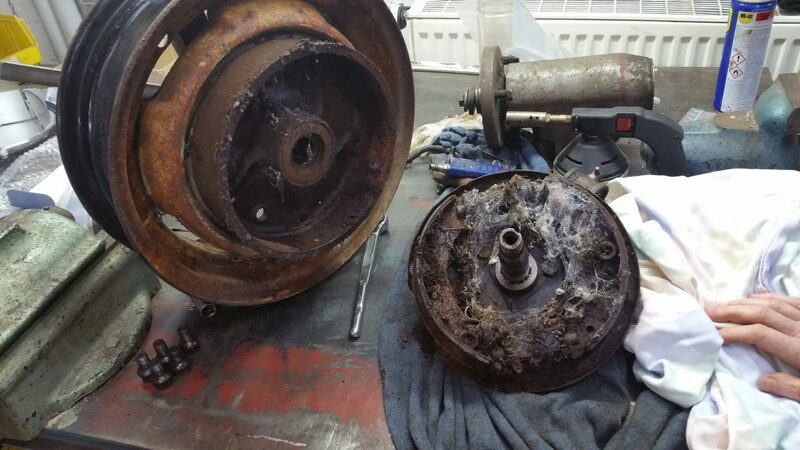 Sure the wheel cylinders needs a lot of attention, but –hey!- they are there! 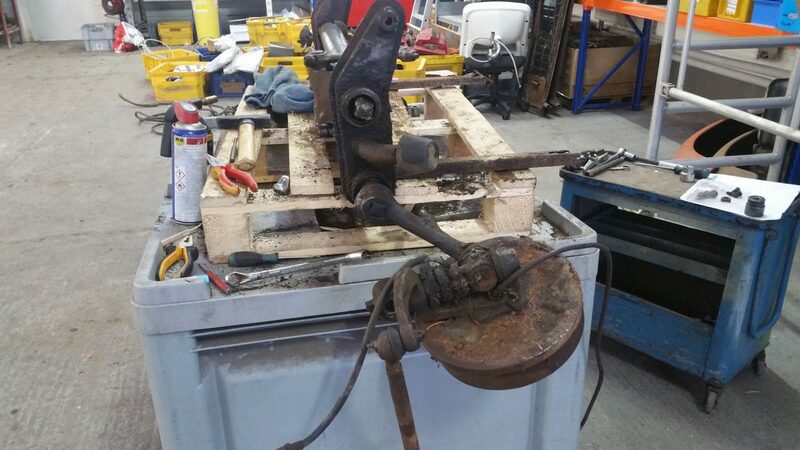 The brake shoes are the correct ones and we can surely use them again when we rivet new brake linings on. 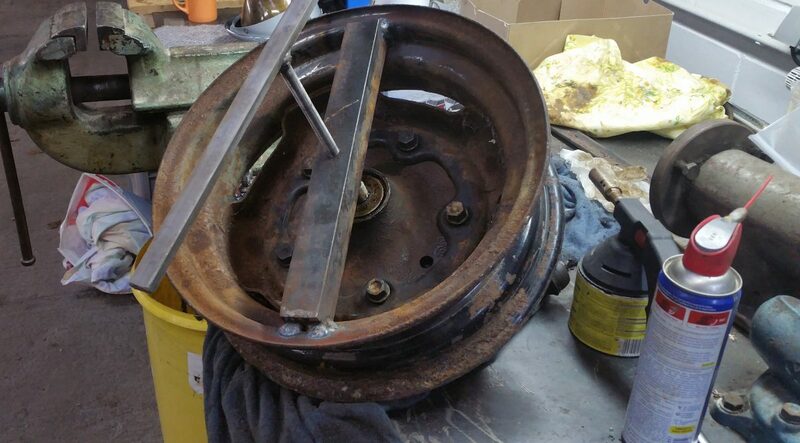 The drums need just a proper cleaning and –just for the safety- a set of new wheel bearings. Also the steering knuckles don´t look too bad. 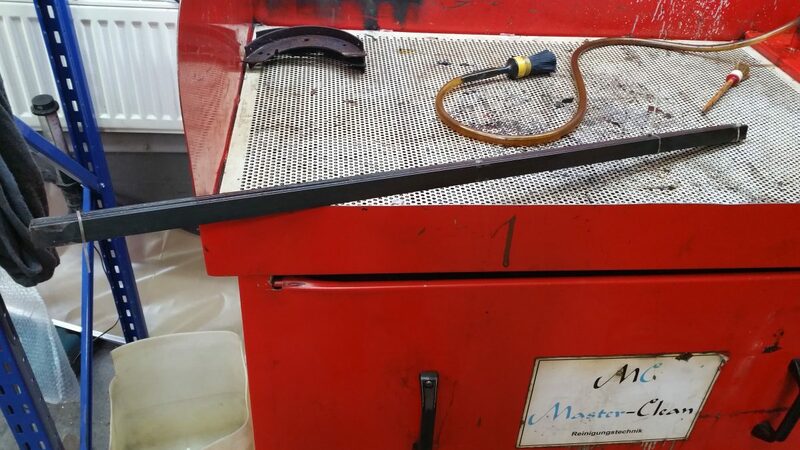 But I will send them to Christian Grundmann´s mechanic Marcel for inspection. Let´s see what he will tell me. 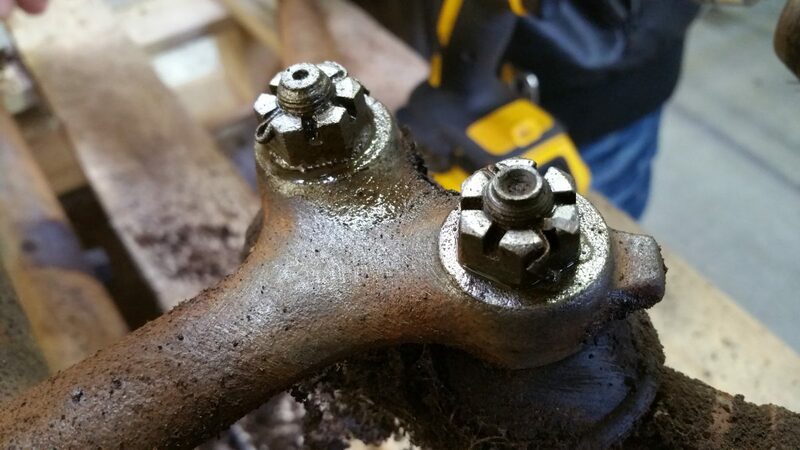 Another all original tie rod end. It´s worth a try to save it too. So, let´s heat it up! 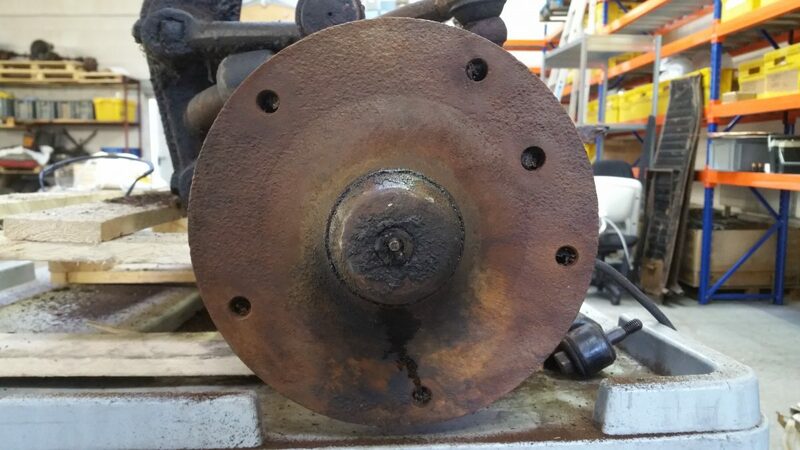 Replace an all original wheel cylinder by a more or less working substitution? No way! I will rebuild this one here. Stay tuned on this channel and I will show you how. Saving every little component is essential during a proper disassembling. Bagging it up with detailed markings too. Now the whole axle beam unit is disassembled up to the very last screw. There is one golden rule beside care and tidiness: NOTHING must go in the trash, even this parts which are obviously broken. Maybe you will need them later, at least as a sample. Saint-Exupéry was very right: You always have to clean also the dormant volcano, cause you never know. ⟵Yes, there is some progress! I enjoy your periodic updates. It must be very interesting to work on something so old yet significant. 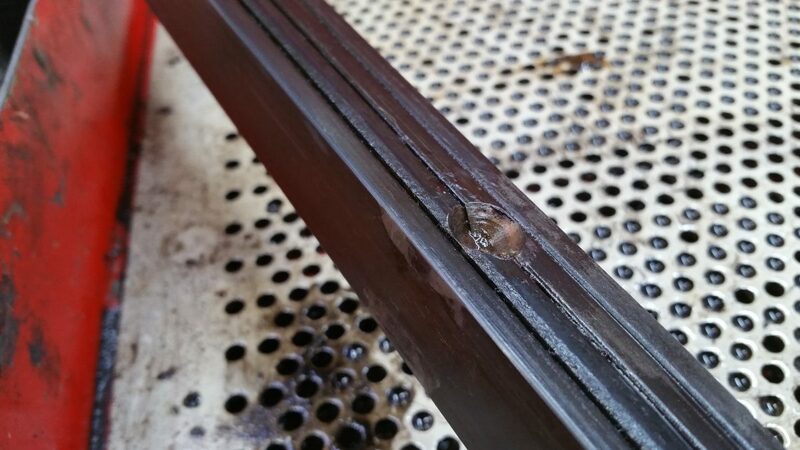 It never ceases to amaze me how well a grease coating preserves metal. 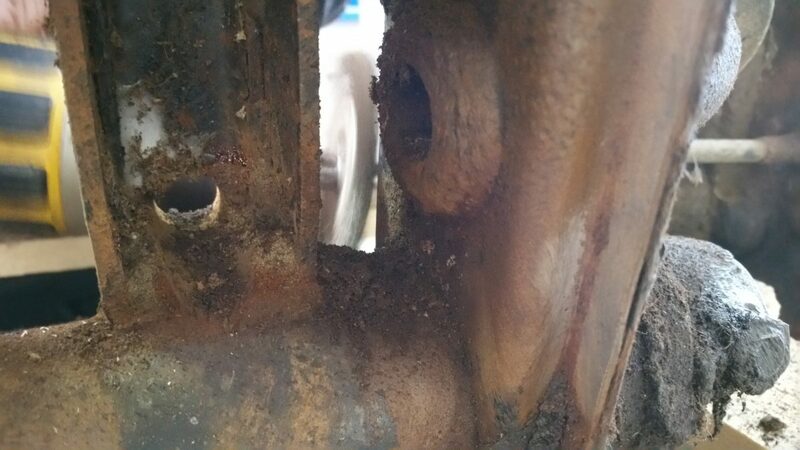 So many of the parts you are removing from the beam and from the drums/backing plates are familiar to me as they are also found on VW Beetles. This common thread keeps me coming back. 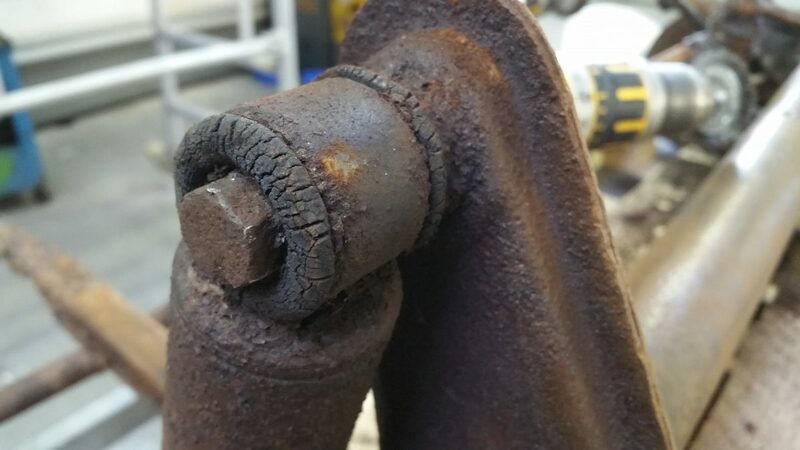 I agree with you to use heat before using force, especially if the parts are well rusted. 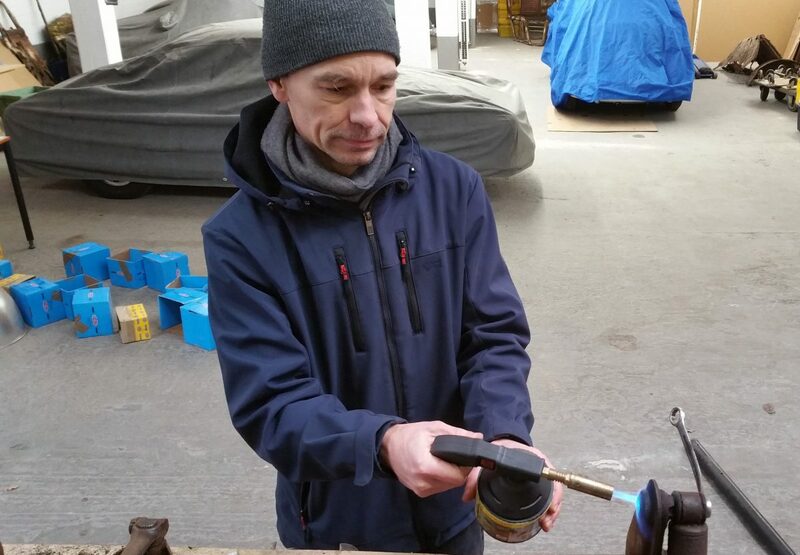 I have been an air-cooled VW restorer my whole life, may first was when I was 14 I am now 54. It is so fantastic to see all this detail in an original form! I have many good books on what is original to all models but there is nothing like seeing it firsthand. I can’t tell you how exciting this is for me, I wish you were in my town. Thank you very much for what you are doing and I look forward to every post. thank you very much for your kind comment. You are very welcome to meet us in Amersfoort at the big Barndoor Gathering in May. 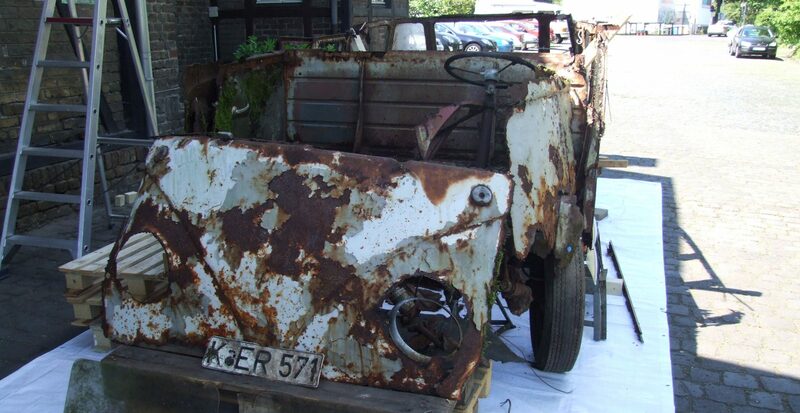 We will bring the whole Samba project, the restored and unrestored parts, to show it to the enthusiasts. It will be a great show. See you there? Florian, I live in the USA and May will come up fast! I sure would love to be there, I will definitely look into traveling to you. I have chills just thinking about the opportunity.